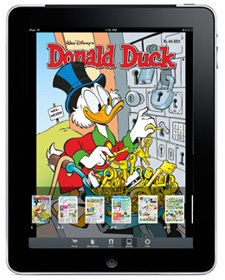 This month Dutch publisher Sanoma started releasing its weekly Donald Duck comic in digital format on the iPad. Readers must first install the free app Tijdschrift.nl and can then purchase 63 different Dutch magazines, including National Graphic, Cosmopolitan and Donald Duck. Each weekly digital issue of Donald Duck costs €2.39 or $2.99, which is rather steep considering the paper copies cost only €2.05 in stores and €1.65 for subscribers. Each digital version does have 8 bonus pages. I just downloaded the latest issue 44 of 2011 (see screenshots below) and it has 52 pages instead of the standard 44 pages, including an 8-page bonus story. This new digital comic is great for Dutch expats like myself. Now I can buy the latest copy of Donald Duck Weekly whenever I want. If I buy every issue it would cost me about €125 per year, which is cheaper than the €179.40 it would cost me to get a real subscription outside Europe. In my opinion it is still too expensive for this to become successful. Sure, the 8 extra pages are nice, but in the issue I downloaded the extra story (H96141) already appeared in the same magazine 4 years ago, which is not much of an incentive to pay the higher price. Part of the high price must be because of the 30% revenue that Apple takes on everything that is sold through the App Store. That leaves €1.67 per issue for Sanoma, which is right about the amount they get from subscribers. Still, with Sanoma saving money on paper, printing and distribution I think that they should be able to lower the price a bit more. At the very least they should allow existing subscribers to download digital copies for free and offer digital subscription prices where you can download a half year or full year at a lower price. Starting January 2011, BOOM! 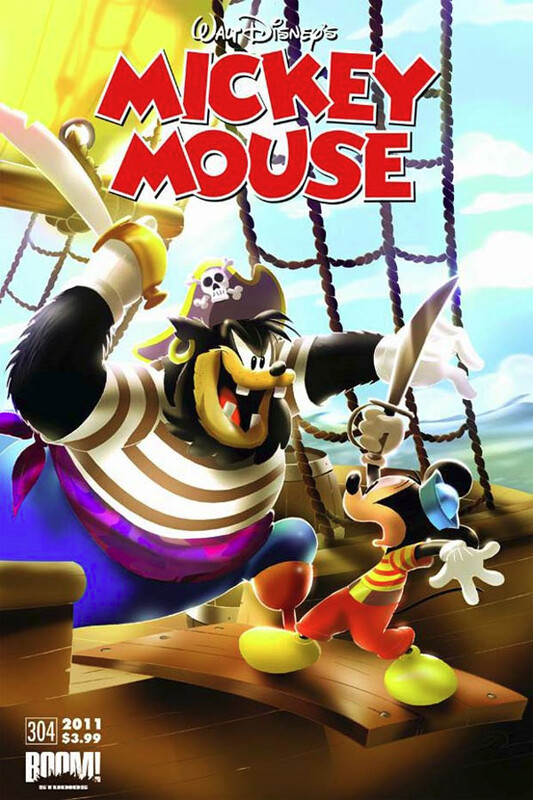 Studios is changing the format of some of their Disney comics. 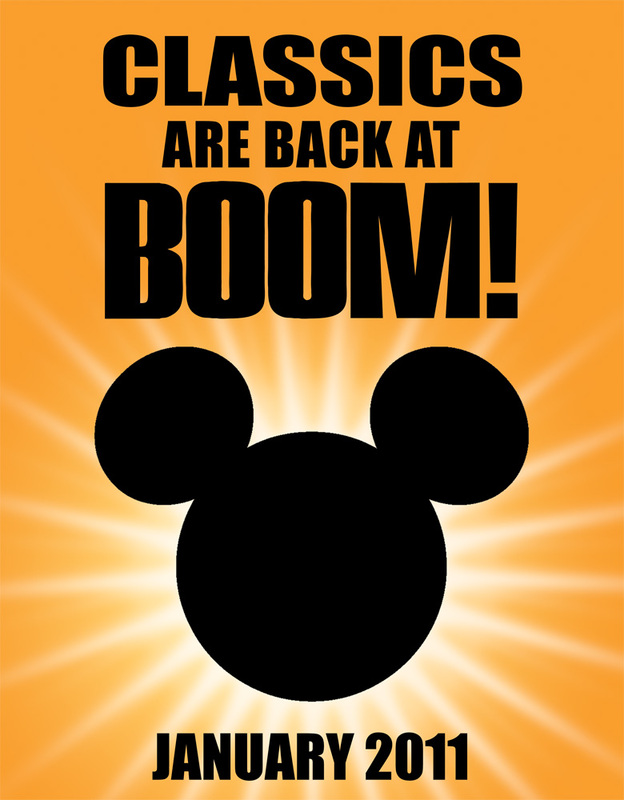 Earlier this week the publisher announced that ‘classics are back’. We’ve now learned what’s inside their January line-up and it’s good news for fans of traditional Disney comics. 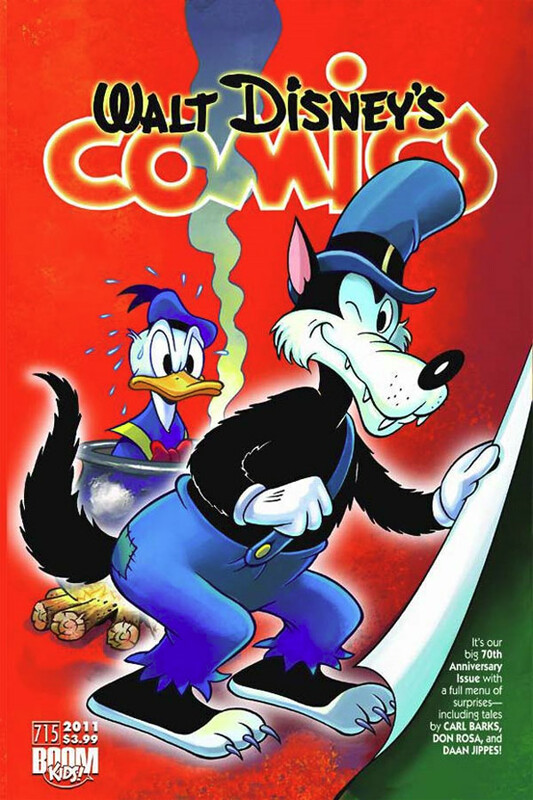 For the past year we’ve been seeing mostly long Italian adventure stories in BOOM!’s Disney comics, such as Ultraheroes and Wizards of Mickey. It now looks like BOOM! is returning some of their titles to a more traditional format, with several short stories in each issue, featuring both classic reprints and new stories that haven’t been seen in the United States yet. Fantagraphics Books announced at the Comic-Con today that it has partnered with Disney to publish a complete collection of Floyd Gottfredson Mickey Mouse strips. The books will reprint all of the legendary artist’s Mickey Mouse daily newspaper strips from 1930 to 1975, in chronological order. On Techland.com publisher Gary Groth commented: “There was a Sunday strip, but it wasn’t part of the continuity. We’re going to do the dailies for now, and then I think we’ll probably go back and do the Sundays. The dailies were continuity, six days a week. […] This is a dream project, just like “Peanuts” was. I think it’s the last truly great, masterful strip that has not been reprinted. BOOM! Studios has lots of paperback and hardcover Disney books coming out starting later this year, including ones with classic Carl Barks stories and a reprinting of The Life and Times of Scrooge McDuck by Don Rosa is slated for February. The publisher revealed yesterday that it will release its first Disney hardcovers at Comic-Con ’09 in San Diego next week. Hardcover collections of The Incredibles: Family Matters, Cars: The Rookie and The Muppet Show will be available at a limited numbered set of 250 and writers Mark Waid, Alan Porter and Roger Langridge will be doing signings of these exclusive editions (see schedule). On his blog, David Gerstein provides an in-depth account on his experience at Egmont working on the development of Tamers of Nonhuman Threats, a Disney comics series starring Donald Duck and Fethry Duck. Egmont Ehapa Verlag in Germany has launched a new version of their official website for Lustiges Taschenbuch, one of Germany’s most popular comic books. The new website features more news, a gallery and insider information about the publication. Lustiges Taschenbuch is a 250-page pocket book featuring 3-tier Danish and Italian Disney comic stories. It sells about 240,000 copies each month. Duck Comics Revue is a relatively new blog on which the author reviews and analyzes classic Carl Barks stories. Steve Geppi, owner of Gemstone Publishing, the former publisher of Disney comics in the United States, has congratulated Boom! Studios on getting the license for Disney’s standard characters. “While I am of course disappointed that I won’t be the one publishing these great characters anymore, I believe the future for them is still one of untapped potential,” he writes. Boom! Studios released three new issues from their Disney line-up this week. 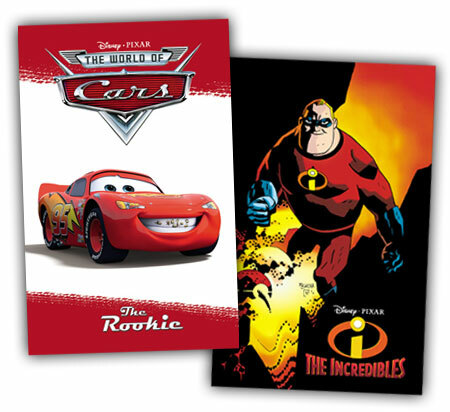 June 24th saw the release of Cars: The Rookie #3, The Incredibles: Family Matters #3 and The Muppet Show #4. In the Netherlands, the Dutch Donald Duck weekly is giving away a free DVD with new 6-month subscriptions. 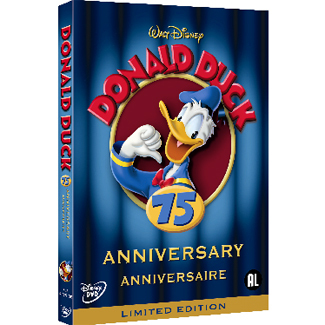 The DVD celebrates Donald Duck’s 75th anniversary with ten classic animated shorts. That’s all folks. If you have any interesting news on Disney comics from anywhere in the world please don’t hesitate to contact me.